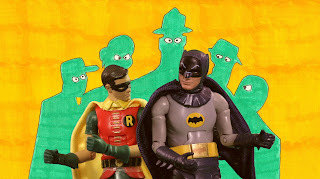 Home » » Stop Motion 1966 Batman TV Intro! I thought this was fun. Enjoy! About 40 years ago, Adam West and Burt Ward socked and blapped its way into televisions around the world. Team Reckless Abandonment worked countless hours to pay tribute to the dark night and his young ward. Bam! This isn't lego Batman. Mattel's newly released line of '60s Batman inspired action figures worked perfectly to bring this classic TV intro to life. Oklahoma City-based folk band, O'Fidelis, lent its musical talents to cover the catchy "Batman" theme song and Nathan Poppe once again supplied hand-drawn backgrounds to complete the fun. Oooof!